Jean Paul Gaultier bid adieu to designing RTW during ss15 PFW much to the dismay of fashion lovers. No need for tears though, L’enfant terrible is concentrating on couture! Dozens of Hollywood names gathered around for his final ready-to-wear show, all in celebration of his forty years of contribution to the fashion world. The show was a marvelous event set up as a mock beauty pageant show, and the models were dressed in honor of the eighties, urban culture, and even Lucha Libre. Broad shoulders and big, dramatic hats a la Joan Collins, Gaultier brought back the eighties look of the working woman, and pinstripes suits that even had a Capone-esque vibe to them. He made them unique with his half-cut tailoring, dividing the masculine look from a more feminine, dressy approach. The pieces were all black and white, with accessories including big, round and square earrings and leather gloves in true eighties fashion. Ascots were also early 20th century business wear that Gaultier incorporated in leather and chiffon. 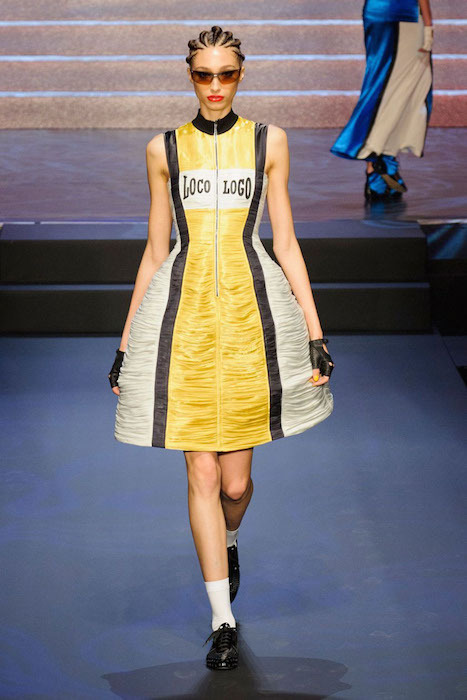 In transition to the early nineties, this run presented heavily boxing sportswear-inspired dresses. Bold colors accented by black and white stripes are reminiscent of the sporting goods brand Everlast, which rose to popularity in the nineties in New York urban culture. Though the run that perhaps brought forth the most humor throughout the night’s extravaganza was the nod to Lucha Libre. A little ode to Mexican wrestling culture, ethnic patterns, skin tight pants in bright shiny colors wonderfully paraded down the runway with all the models sporting wrestling masks, making the walk that much more fun. Check out a live vid here of the finale shared by Anna Dello Russo. The night was full of laughs and cheers. At the end of the mock beauty show spectacle, Gaultier appears wearing his own sash, proving that he’s the real winner of the night. It’s safe to say all those in attendance celebrating his legacy were in agreement. check out the sparkles. JEAN PAUL GAULTIER farewell RTW collection ss15 selects by Brigitte Segura, written by Andrea Porro.